Young Australian artist Mia Moretti has been cancer free for nine months. But her battle with the illness has taken its toll, leaving her depressed and tormented by overwhelming fears. What's more, she can't seem to paint anymore. Mia needs a fresh start so when a surprise opportunity to travel to Tuscany presents itself, she takes it. With any luck, this trip will help her find whatever it is she needs to open her heart and start painting again. What she doesn't count on is meeting Luca, a handsome Italian mechanic. With his smile, his warmth and his inspirational outlook on all the good things life has to offer, he sweeps her off her feet. As Mia slowly lets down her walls and allows Luca in, her passion for life is reignited and her new perspective begins to inspire her art. But just when she's ready to let go of her past, will a tragedy threaten her new life with Luca? ©2017 Vanessa Carnevale (P)2017 Audible, Inc. This book was a lovely journey to Florence. An easy read where you day dream about romance, Food and the beauty of italy. Although predictable I always want to be transported to another place and go on an adventure with the characters. So it was S really nice journey to Italy. And now I'm going there! Buon aperitivo. Vanessa Carnevale'a podcast drew me into her realm and I constantly pestered her about when I could read her book. Finally it was released in the US via audible and I tried a free trial just for it. 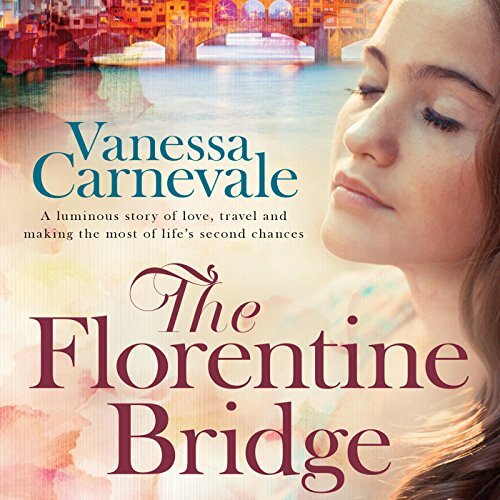 The Florentine Bridge is a beautiful story of love and travel, finding everything after losing yourself. I lived in Florence during my time studying abroad and I fell in love with the city. ANYONE who had been to Florence will love this novel. It reminded me of why I loved Italy in a time I truly needed to remember, and brought back the memories in a way that my senses thrived from. Vanessa's debut novel has a great deal of detail and is excellently written, making me want to continue my stories as well. The words were perfect. The only thing that was odd to me was actually listening to it. I'm not a huge fan of audio books so the woman speaking, changing from male Italian voices to female Australian voices were a bit weird. Overall I loved the book and gave it top stars because the storyline was wonderful, the characters made me love them, and I wanted to read more. Thank you Vanessa for reminding me of my love for Florence.